Wedged midway between Bali’s numero uno tourist pit Kuta and fashionista hub Seminyak, Legian beach occupies a somewhat comfortable middle ground — slippery and sleazy one moment, old school beautiful the next. Terry, Gazza and Pete all had a moment. Like Kuta, and to a lesser extent Seminyak, Legian is very much an Australian outpost. Sport bars run AFL telecasts, you can’t throw a satay stick with spearing some young, tanned, shirtless, shoeless surfer and the Aussie twang (from both the visitors and the locals) is omnipresent. Everyone’s here for the beach (or perhaps some for the bars) and the first morning you wander down, you’ll see why. The sand isn’t as dark as Seminyak’s and generally the beach is nowhere near as crowded as Kuta. The surf is ideal for novices through to surfers of an intermediate level and, while yours truly learned to surf at Kuta, there are a bevy of surf schools on Legian to choose from should you want to give it a go. For those not interested in trying their hand at surfing, you’re going to be restricted to shopping and laying around on the beach — yeah sounds awful doesn’t it. There’s a large clothes market on the north side of Jalan Melasti and there’s a gazillion smaller clothes and knickknack stores on Padma Utara and particularly Jalan Legian, with the latter having a more boutique-y flavour of stores to it. As the day gets on and the sun begins to sink a bevy of impromptu beach bars pop up among the deckchairs and while the busier beach-bar scene is more towards Seminyak, Legian isn’t too shabby when it comes to cold drinks with your feet in the sand. Not a lychee martini in sight. 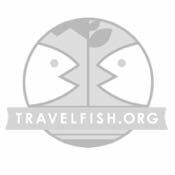 The restaurant scene is very tourist-focussed with a heavy emphasis on affordability and offering absolutely every type of food imaginable. For Western dishes, it’s difficult to go wrong at Swish while for local fare, Warung Yogya stood out for us. If you’re looking for a morning caffeine hit with WiFi thrown in, try Mugshot Coffee. For a nightcap after dinner, there’s a pretty busy bar-scene off Legian beach, but depending on the bar you choose some of the regulars may have been at it, hard, since 10:00 or 11:00 — that’s right, in the morning — so things can get pretty rowdy. For later entertainment we’d lean towards the clubs and bars of Kuta and/or Seminyak, than the off-the-beach options in Legian. Unlike Kuta, there’s no beachside road that is open to traffic. There is a wide boardwalk area, but vehicles generally are not allowed on it, so it is a far more peaceful scene than at Kuta (which degenerates into a parking lot meets chaotic mess come most afternoons). For our purposes we consider Legian to stretch from Jalan Melasti in the south to Double Six in the north (though many would consider the northern part of this to be Seminyak), with the name changing Werkudera/Padma Utara/Sahadewa running north-south between Jalan Legian and the beach. Much of the cheaper accommodation in Legian runs off this north-south road and the absolute rat’s nest of gangs that runs off it. Most of the beachfront strip is given over to larger beach resort-style hotels — some are quite smart, others could do with a bit of a bulldozing — but for those whose budget doesn’t stretch that far, there’s a cornucopia of choices back off the beach road, and while you won’t have a beach view, unless you’re right at the bottom of the budget barrel, you should have a pool. Can I put in a request for the pool without the other guests please? If you simply must have a beachfront, resort-style hotel in Legian, the Padma or the Bali Niksoma would be the first two we’d suggest, with the Ramada Camakila coming up a close third. If you don’t want to spend as much as these places cost, Hotel Puri Raja is the best value midrange, family-friendly hotel in Legian. 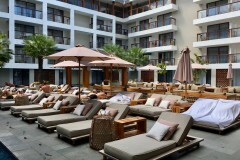 See Agoda for a full range of discounted hotels in Legian. 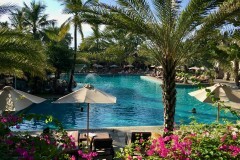 That said, we thought the overall best place on offer in Legian was actually off-the-beach. 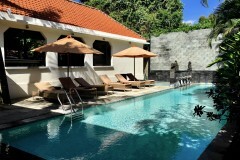 Puri Damai embraces the tag “boutique losmen” with gusto and, while the pool is small, we were very impressed. Ideal for families, but be prepared to book well in advance to get in. Rooftop sala at The Island. At the more budget and backpacker end of the stick, Su’s Cottages (1 and 2) are up there in the value stakes, though the second branch is a long walk from the beach. At the northern end of Legian (actually just south of where Jalan Double Six meets the ocean, Puri Naga Seaside Cottages is gob-smacking value (though pack ear plugs for the evening) while Blue Ocean, while a bit, well, aged, is likewise affordable. Trendy The Island Bali was overpriced to our mind, but is a hit with gap-year students, so this could be to your liking. Bali’s beaches are overcrowded, dirty and have crap sunsets. A selection of some of our favourite places to stay in Legian.